When you publish another article you’re not sure anybody will read. And you don’t know if it will attract traffic – or crickets. Even if readers do show up, you don’t know if they’ll engage with the content or lurk in the shadows, staying silent. Every new post is a toss-up – and it’s agony. You know it shouldn’t be like this. It feels as if something’s missing. And you’re right. You should listen to your gut. Something is missing on your blog. It’s the magic cure to the frustration of never knowing whether your next post will even get noticed. Have you ever been to a town that you instantly clicked with? Somewhere you instantly felt at home. A place you belonged. Conversely, you’ve probably been to cities or towns that felt cold to you. You couldn’t wait to leave because, even if they were beautiful places with a lot to offer, they were missing something – at least for you. So what’s the difference between the first case and the second? How can one place make you feel at home and another make you feel like an unwelcome stranger? Well, the answer is community. If you don’t feel you’ve found your natural home when you visit a town, you won’t want to stick around, move in, and put down roots. And your blog is the same. When visitors first land on your blog, they might spend a little time exploring what it has to offer, much like a tourist visiting a new city. But they won’t stay for the long term, engage with you and other readers, or give you their unwavering support unless they feel like they’ve found “their people” – a community of like-minded readers that fits like a glove. Traffic and engagement on demand. If you want to get as many readers as possible for your blog posts, there’s no better way to achieve that than by sharing it with a community that already eagerly anticipates your latest content. Audience research baked right into your blog. When you have a community of people who engage with your blog, you can find out what they want to read, share, and even buy just by listening in on their conversations, or asking them. Less pressure for you, the blogger. Communities are great for connecting people and providing members with the ability to foster relationships. This takes some of the pressure off of you as the blogger from being the only one supporting readers and answering questions. So how do you build a community around your blog? Fortunately, there’s one hack that will make your life as a blogger far easier. It will give you the perfect platform for building a community your readers will love, and it’s there for the taking. Want to know the best way to build a community around your blog? I know, I know. Facebook is for stalking your ex-girlfriend and ogling your boss’s vacation photos, right? Whether you love it or hate it, Facebook truly is a blessing sent down from the community-building gods. Facebook attracts a huge crowd. With 71% of the adult online population on Facebook, it’s hard to imagine a better gathering place. Facebook users are active and engaged. Surveys show that families spend as little as 36 minutes together each day, yet the average Facebook user spends 40 minutes per day on the social network. Facebook fosters the community mindset. You probably log onto Facebook to see what your family, friends, neighbors, and colleagues are up to, right? These groups make up your community. So when you log on to Facebook, you’re already in the community frame of mind. 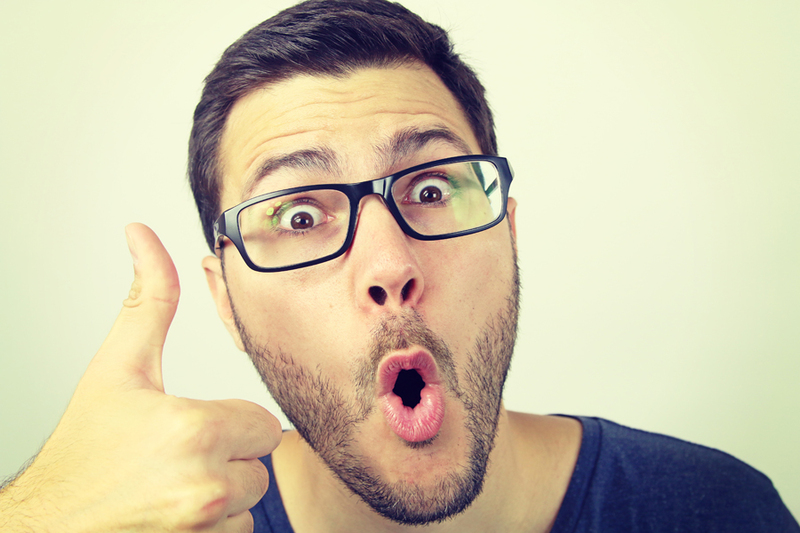 You might think you’re already using Facebook to create a community around your blog. After all, most bloggers create a Facebook page where they post their latest article or the occasional status update, hoping that readers will “like” the page and see their updates. But in reality, since Facebook modified their algorithm, posts are actually seen by only a small fraction of your fanbase, unless you pay to sponsor your posts. Even if your page has thousands of fans, only a few hundred may see each update. So trying to build a community through your blog’s Facebook page becomes either exhausting or expensive. That’s right. The same feature you’ve used to share family photos or organize a party can be used to build a strong community for your blog. When I’ve helped my coaching clients set up Facebook groups around their blogs, a question that inevitably comes up is whether the groups should be focused specifically around their blogs, or around the wider subject matter they cover (often having to do with a goal or goals held by members of the prospective community). Creating a community focused on the goals of your target audience – the wider subject matter – means the community and your blog are only loosely connected, which means that some members may not even be aware of your blog. The group conversations become less focused on your content, but have the potential to reach more people. Building a group specifically to foster conversations between members of your blog’s tribe can exclude your wider audience, because it’s less relatable to people who have not yet heard about you and your blog. However, it creates a tight-knit community around your blog. The Entrepreneur Incubator is a great example of a group created to focus on the goals of a target audience using the blog as the backdrop. The Screw the Nine to Five Community is a great example of a group created to foster conversations between existing blog audience members. There’s no right or wrong way, but the answer to this question will affect how you set up your group. Name your group according to its focus. 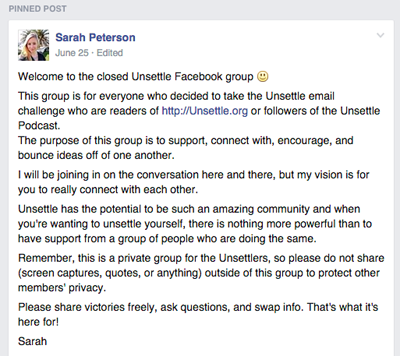 For example, I’ve built my Facebook group to foster conversations between the existing members of my audience, so I’ve called mine The Unsettle Facebook Group. If your group is focused on the goals of your target audience, make the name reflect those goals. For example, you might call a group for keen tennis players The Tennis Mastery Community. When setting up your group, you must add one member to start. My poor mother gets added to all of my groups. You can always remove them later. 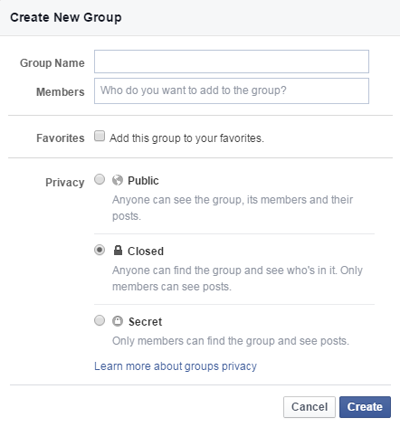 Choose a “closed” group. Not only do closed groups make your community feel safe to have conversations that aren’t public to the entire Facebook network, but they also create an air of exclusivity, which will help your members feel like they are part of something special. Another benefit of a closed group is that it will also discourage trolls from spamming it. Choose the right keywords. 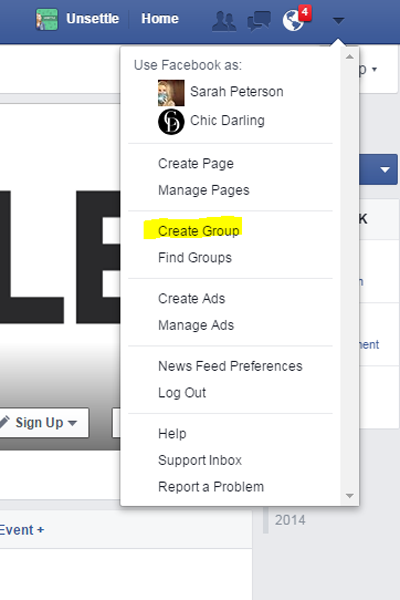 Your group is searchable in Facebook through keywords, which you can set when you start your group. Facebook calls these “tags,” and to capture users who aren’t already reading your blog, set these keywords to be what your blog and group are about. For example, if you have a blog about Crossfit, you might set your “tags” as “Crossfit,” “Fitness,” and “Get Active.” If a tag is valid, it will pop up as you begin to type the first few letters. Upload a cover image. An attractive cover image will make your group more visually appealing. You can use your existing logo, or create a compelling cover image with a tool like Canva, which has a built-in Facebook Cover creator. Make sure your image is instantly recognizable to people familiar with your blog’s color palette and logo. Create a welcome message. When members join your group, your welcome message will greet them and give them a sense of what the group is about. Include details like who the group is for, why the group exists, and your vision for how members will use the group. To make sure this information is always in view, pin the post to the top of the page. After it’s up and running, you need to get people in your group. How do you get people to join? When you’re first starting out, it can seem daunting. After all, the last thing you want to do is to start a deserted group. That makes you feel like you’ve thrown a party that nobody shows up to. In fact, many bloggers shy away from starting groups simply because they fear nobody will join. But don’t let that hold you back, because as daunting as it seems, getting group members to join your group is not rocket science. Showcase your group in your blog’s menu. The menu on your blog should be reflective of what you want people to pay the most attention to. That makes it a great place to put a link to your Facebook group. Broadcast your group on social media. When you first start your Facebook group, post a link on Facebook, Twitter, Google+ and any other social media platform you have. Promote your group with a call to action. Good bloggers have a call to action at the end of each article. Rather than asking your readers to leave a comment in the comments section after reading your post, prompt them to join your Facebook group instead. Send an email to your list. If you have an email list, your subscribers are perfect candidates for joining your Facebook group. They already like you and your blog enough to subscribe to your email list, so send out a quick email letting them know that they can connect with like-minded people in the Facebook group. So now that you’ve landed your first members, how do you get them talking? How do you engage them and make the group a real community? Nobody speaks. You could cut the silence with a butter knife. And the only posts in the group are from you. That’s a community-builder’s biggest nightmare. Unless someone breaks the proverbial ice, your Facebook group can be as silent as a library. Pose a question. 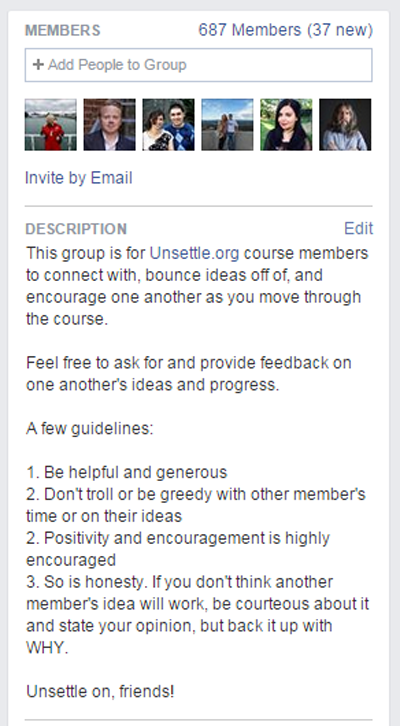 Your Facebook group is new, so you have to train members to be active. That means that you need to lead by example. Post a few questions in your group to get the first few people responding. For example, if you are building a Facebook group around your nutrition blog, you might ask what ingredients group members put in their smoothies. Ask a group member to get the ball rolling. When I started my group, a good friend happened to be an Unsettler and joined. I asked her to start conversations and post the questions that she was asking me privately in the group. Encourage group posts in emails and articles. To get people talking initially, instead of sending an email about a blog post and asking for your readers to leave a comment on the post itself, ask them to discuss it in the group. Give them specific talking points. When you’ve started sparking the initial conversations, the group will naturally begin to come alive. Whether they’re online, at work, or in your local neighborhood, all successful communities have some rules, even if they’re unwritten. In your town, they’re the local laws. They exist to make community members safe, to keep the community functioning and happy, and to set boundaries. It’s crucial that your community members feel comfortable, safe, and included in your group, too. If they don’t, your community is unlikely to thrive. That’s why it’s a great idea to work with your members to establish a code of conduct or some “policies” or “guiding principles” that govern the group. How should members interact with each other? What are some guidelines for the types of posts that are allowed? Are there any “no go” zones? For example, if you have a weight loss blog and are building your Facebook group around that, are members allowed to post photos in their bathing suits to demonstrate their progress? 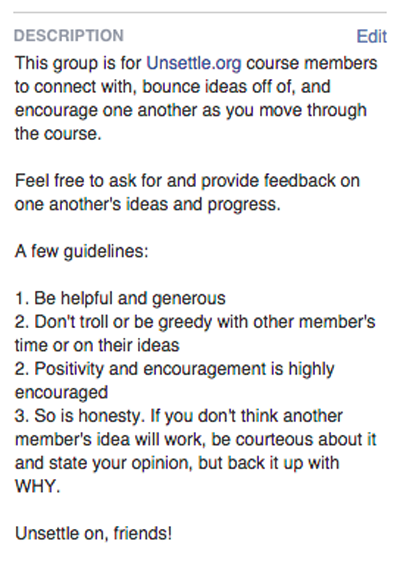 Working with your group members to establish these guidelines makes your group feel more inclusive – like a democracy rather than a dictatorship. Crowdsource your group members’ suggestions on how they’d like to see the group unfold and let your guidelines evolve accordingly. Notice that these guidelines are short, simple, and friendly. You don’t want new members to feel browbeaten by a big list of rules the moment they come through the door. Once you’ve ignited your first community discussions and set the parameters for healthy interactions via your group guidelines, you’ll need to make sure that the community continues to grow and that interactions between members flourish. Here are some of the best ways I’ve found to do just that. The greatest communities enjoy participation from community leaders. That’s why it’s so important to spend time in your Facebook group. Don’t just set it and forget it – make it a daily habit to go into your group and answer questions, interact with members, welcome new members, and give shout-outs to people. Several members ended up buying the book and reported back that they found it helpful. Spending time in your group can be time-consuming, especially as it grows, but you’ll find your participation will easily be worth the extra effort. I spend around 30 minutes each day in my Facebook group and the time commitment pays dividends in the form of engagement and bonds with members. Your Facebook group should break down the barriers between you and your readers, so it’s crucial that you’re an active member. As a blogger you’re accustomed to setting the direction of your blog. And as the owner of a shiny new Facebook group you’ll probably have strong ideas about how you want the community to grow. As a result, it can be difficult to let the conversation in your group happen organically. However, effective communities aren’t run by dictators, so instead of trying to control everything, let the conversations unfold organically. 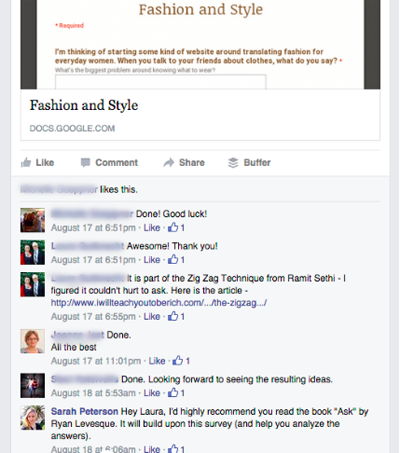 When I first started my Facebook group, a discussion arose around monetizing a blog and one member recommended advertising. I strongly disagree with blog ads as a monetization strategy for most blogs, so I linked to my post on Smart Blogger that explains why. But looking back, I wish I hadn’t. I should have waited and let the conversation develop more naturally. Established members of the community, if they agreed with me, would have likely stepped in and started a debate about it, which would have been healthier than my heavy-handed meddling. Letting these conversations unfold organically is how your tribe will learn, grow, and evolve. So let debates happen. Allow differing opinions and step back from those conversations you’re itching to steer in a direction that’s more comfortable for you. You may have noticed that in most communities, some members participate more than the rest. In a physical community, they might be the more prominent members who go out of their way to connect others and act as informal leaders. In your online community these people will be instantly recognizable – they’re the names that show up most often in your group. They regularly connect with other community members, share your articles on social media, leave comments, and even email you, too. These informal leaders are crucial for maintaining a lively and engaged community. They’ll enable you to set fire to your group and ramp it up far faster than if you, the official leader, work in a vacuum. They can welcome others into the group, spark new connections and conversations, and help advocate for your community. So encourage these informal leaders. When you see somebody stepping up to the plate in your group, acknowledge them! Send them shout-outs, thank them, and even give them an “official” title. You don’t have to pay them, but you do have to encourage and acknowledge them. You can also contact these informal leaders privately and thank them for what they’ve done so far within your group. Ask them if they’d be willing to be community leaders. Chances are, they’ll be honored to help you lead your group. As you know, one huge benefit of building a community is that it’s a great way to research your target audience. And nothing fosters engagement and community like making people feel they have an impact, so ask your group members for their input. For example, if I’m starting a blog series, I ask the members of my Facebook group if they have anything they want me to address in it. Then I tag them in a Facebook group post when the series is live letting them know that I addressed what they asked for. They get a sense of pride and contribution, and I get to know more about how I can help them with the unique challenges they’re dealing with at the time. Throw a Party. Over on Twitter, organized chats encourage participants to use a common hashtag at a specific time to talk about a given topic. This is a great method of generating some group buzz – and luckily it’s far easier to do in your Facebook group than it is on Twitter. Set the date and let members know the time and the topic. When everyone shows up at the same time to mingle with one another, it can do wonders for your community. Create a Theme Day. Do you love #TBT too? There’s a reason why Throwback Thursday blew up on Instagram. It’s fun, personal, and takes the pressure off of posters to think of something original to post every single day. So create your own theme days for your group. Once a week, structure your updates around a specific theme. Not only do theme days like these encourage participation in your group, but they also relieve you from having to constantly think up new posting material. Share Some Eye Candy. We’ve all seen the statistics – visual content gets far more engagement than text only. So catch your members’ attention by posting (and encouraging others to post) engaging, eye-catching images as a discussion point. Post quotes over images related to your topic to motivate members. Try posting funny memes – or even creating your own. Ignite New Friendships. A Gallup survey shows that people who have a best friend at work feel more connected to their employers. Likewise, when members of your community make friends with each other, they’re likely to feel more bonded to you too. So become a “connector” and introduce members to each other who have something in common. If a new member introduces herself to your parenting community as a single mother of a two-year-old in Seattle, tag another single mother in the same area in your welcome post. Post a Rallying Cry. You know when you read or watch or hear something that just amps you up? When you strongly agree or disagree with a cause or message, it provokes strong emotions – and it could do the same for your community. So if there’s a news story about your topic or something big happens in your niche, don’t ignore it. Post it, start conversations about it. Rally together around it. The ones who “get” you, who respond to your ideas, who grow with your help and support. Well, they’re looking for you, too. They want to be part of what you’re doing. And when they find you, they want to stick around. You just need to give them a compelling reason to do so. And you do that through community. Because you know what? They want to connect with each other, too. So get out there, start your Facebook group, and gather your tribe. Because once you have a community of raving fans rooting you on?